FANNIE FRANCIS AGE 76, CELEBRATES HER 59TH YR OF MARRIAGE TO JESSE ABRAMS. THEY WERE MARRIED ON AUG 26 1885. OTHER MARRIAGES OR ENGAGEMENTS ANNOUNCED IN THE SOCIETY SECTION. MARION T. CON CANNON TO LT. CHARLES J. GAY. CLAIRE W.L. SCHMIDT TO HENRY B. SMYTH QUARTER MASTER 2ND CLASS US NAVY. JOHN H. BORN JR. (PRIVATE FIRST CLASS) TO DORIS MAY MAXWELL. THE FOLLOWING PEOPLE HAD MARRIAGE LICENSES ISSUED. and they appeared on the SOCIETY PAGES. Most of the ones listed, have lengthy information, if you would like a copy, please email me. say 1940'smarriage page please............................on nyvagenealogy!!!!!!!!!!!!!! HOWARD SCHUB AND DOROTHY KELLER TO BE MARRIED JUNE 6. Long Island Daily Press May 5 1948 Wedensday & appeared on the SOCIETY PAGES. Title " THEY WENT TO CANADA" The former Dolores Fink of 95-19 76th Street in Ozone Park and her brideroom, Raymond Bonnevie of 138-29 232nd street, Laurelton, Toured New England en route to Canada on their honeymoon. He is Army Veteran. title " Living in South Carolina" The former Joan Therese Colyer of 138-31 90th ave, Jamaica and her bridegroom, Raymond Rodgerr McKevlin of Charleston, S. C. are making their home in that city, where he is employed in the post office. The title was "Queens Village Man & Bride Sail to Bermuda"
John H. Scholl of Queens Village & his Bride, the former Wanda A. Schuvart of Union, NJ., a graduate of New Jersey City Medical School of Nursing, are on a Cruise to Bermuda following their wedding. The Rev. Edward Bigley performed teh ceremony in the rectory of St. Michael Roman Catholic Church, Union, NJ. A reception followed at the Veterans Hall in that Community. The matron of Honor was Mrs. Dolores Bersen of Union, the brde's sister, and Warren Scholl of Queens Village, the bridegrooms brother was best man. The bride is the daughter of Mr. and Mrs. John M. Schuvart. Son of Mr. and Mr.s John H. Scholl of 108-17 217th place, the brdiegroom is a graduate of Jamaica High School and served with the Army five years in the European theatre. TITLE " HONEYMOONERS IN PENNSYLVANIA"
Christian Streenk of Glendale and his bride the former Irma Trabert of Ridgewood, are visiting Split Rock Lodge, Pa. on a week's honeymoon. FRANK SHEILDS 43, OF 21 SAMMIS PLACE AND MISS ELSIE MURIEL MOULD 27, OF 66 NORTH FRANKLIN STREET, BOTH OF THEMPSTEAD. CHARLES L. CONERTY 44, AND MRS. IMELDA MARIE RIELY, 41 BOTH OF 874 BROADWAY WOODMERE. EDWARD B. REED, 28, OF HOMESDALE, PA AND MISS EVELYN EILEEN CURTIN, 21, OF 78 KINGS PARKWAY, BALDWIN. WILLIAM EL. KROLLAGE, 25, BABYLON AND MISS JEAN BETTY GAFFNEY, 19, OF 52 HODSON, AVE LYNBROOK. Title "First Dance" the former Irene Kotoski of 145-40 105th avenue, Jamaica, and her bridegroom Eugene Kazanecki of 68/-23 Jay avenue, Maspeth, dance at their wedding reception. they went to Washington on their honeymoon. JOHN T. MACEVOY OF BELMAR, NJ. HAS ANNOUNCED THE MARRIAGE OF HIS DAUGHTER, MISS NANCY NADEDA MACEVOY TO LT. HARRY J. RITTERBUSHY, JR. SON OF MR. & MRS. HJ. RITTERBUSH OF QUEENS VILLAGE AND GLENWOOD AVE. POINT LOOKOUT. THE CEREMONY WAS PERFORMED IN BALTIMORE MARYLAND FEB 2, BY CAPT. A.H. ALPANALF, CHAPLAIN OF THE 3RD SVC COMMAN. 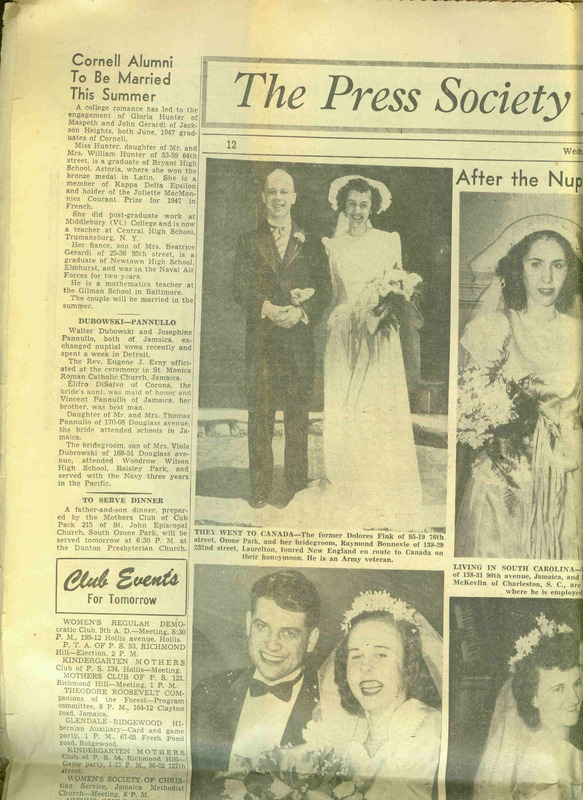 MISS NANCY HOAG OF BELMAR WAS THE BRIDE'S ATTENDANT, & SYLVAN VAN AALTON OF FOREST HILLS WAS BEST MAN FOR LT. RITTERBUSH. A RECEPTION FOLLOWED AT THE LORD BALTIMORE HOTEL. LT. RITTERBUSH WAS GRADUATED FROM JAMAICA H.S & NYU & WAS ASSOCIATED WITH THE INTERNATIONAL BUSINESS MACHINES COMPANY BEFORE ENTERING THE ARMY, WHERE HE IS ASSIGNED TO THE ADJUNCT GENERAL'S DEPT. MISS CHARLOTTE MAIBERGER FOSTER DAUGHTER OF MR. AND MRS. JOHN W. LINDSAY OF STEPHEN STREET, BELLMORE, WAS MARRIED TO PRIVATE FREDERICK A. BERGMAN OF BELLMORE SUNDAY AT NOON IN THE WANTAGH MEMORIAL CONGREGATIONAL CHURCH. THE REV. DR. FRANCIS JOHN HAYDEN PASTER OFFICIATED. THE BRIDE WAS GIVEN IN MARRIAGE BY HOWARD OSWALD IN THE ABSENCE OF HER FOSTER FATHER, A PATIENT IN THE SARATOGA SPRINGS HOSPITAL. SHE WORE A GOWN OF WHITE SATIN, VEIL CARRIED WHITE CHARNATIONS AND SNAP DRAGGONS. MISS MURIEL OSWALD WAS MAID OF HONOR AND EDWIN A. URKE WAS BEST MAN. A RECEPTION WAS HELD AT THE BRIDE'S HOME. PRIVATE BERGMANN IS STATIONED AT CAMP PICKETTE, VA. TITLE READS " MISS FULTON ENGAGED TO AIR CADET, TO BE BRIDE OF TOBIAS BURKE, JR.
MR. & M RS. CHESTER C. FULTON OF ROOSEVELT AVE, FREEPORT HAVE ANNOUNCED THE ENGAGEMENT OF THEIR DAUGHTER, MISS MARION B. FULTON TO AVIATION CADET TOBIAS BURKE, JR. U.S. A., SON OF MR. AND MRS. TOBIAS BURKE OF DARIEN, CONN.
MISS FULTON IS A GRADUATE OF FREEPORT HIGH SCHOOL AND ATTENED MARY LAND COLLEGE FOR WOEM AT LUTHERVILLE. GRADUATE OF DARIEN HIGHT SCHOOL AND THE ROOSEVELT AVIATION SCHOOL, CADET BURKE ENGLISTED IN THE SERVICE IN MAY 1941, AND HAS SERVED IN GREENLAND. HE IS TAKING PRE FLIGHT TRAINING AT NASHVILLE, TENN.
MRS. DOROTHY SHELBY OF NORTH WILLIAMS TREET, BALDWIN HAS ANOUNCED THE ENGAGEMENT OF HER DAUGHTER MISS DOROTHY SHELBY TO PRIVATE RICHARD GLOWACKI, U.S. A. SON OF MR. & MRS. CHARLES GLOWACKI OF JOY BLVD. BALDWIN. SATURDAY NIGHT. BOTH YOUNG PEOPLE ARE GRADUATES OF BALDWIN HIGH SCHOOL. MISS RUTH BARBARA HILL, DAUGHTER OF MR. & MRS. LAWRENCE W. HILL OF NORTH WALNUT STREET, WEST HEMPSTEAD & ANTHONY HRONCICH, SON OF MR. & MRS.LEWIS HORONCICH OF SOUTH OCEAN AVENUE, FREEPORT, WERE MARRIED, SATURDAY AFTERNOON IN ST. THOMAS APOSTLE ROMAN CHATHOLIC CHURCH WEST HEMPSTEAD. A RECPETION FLLOWED FOR MEMBERS OF THE FAMILIES & BRIDAL PARTY @ LEXINGTON HOTEL, NYC. THE BRIDE WAS GIVEN AWAY IN MARRIAGE BY HER FATHER. SHE WAS ATTIRED IN A GOING WAY COSTUME, MRS. ISABEL WALSH OF WEST HEMSPTEAD, WAS HER SISTERS ONLY ATTENDANT THE BEST MAN WAS MARK HRONCICH, COUSIN OF THE BRIDEGROOM. THE BRIDE IS A GRADUATE OF HEMSPTEAD HIGH SCHOOL , SAVAGE COLLEGE IN MANHATTAN AND OF VILAL MARIE ERIE PA, SHE IS A TEACHER OF PHYSICAL EDUCATION IN WANTAGH SCHOOLS. THE BRIDEROOM WAS GRADUATED FROM FREEPORT H.S. & IS WITH THE GRUMMAN AIRCRAFT ENGINEERING CORPORATION. MR. & MRS. HORNOICK WILL LIVE IN THE BENNETT APPARTMENTS HEMSPTEAD, UPON RETURNING FROM A TRIP TO LAKE PLACID. MISS MARIE ELEN FROLAND, DAUGHTER OF MRS. JOHN N. FROLAND OF ALEXANDER AVENUE, FARMINGDALE AND THE LATE MR. FROLAND, AND PETTY OFFICER CHARLES J. KELTON U.S. NAVAL AIR CORPS SON OF MR. AND MRS. JOSEPH KELTON OF CEDAR AVENUE, FARMING DALE, WERE MARRIED TUES MORNING AT 11:30AM IN THE RECTORY OF ST. KILLIMS ROMAN CHATOLIC CHURCH FARMILING DALTE. THE REV. BENEDICT WEIGAND OFFICIATED AT THE CEREMONY. GIVEN IN MARRIAGE BY HER BROTHER JOHN FROLAND, THE BRIDE WORE A SHETLAND WOOL SUILT OF AQUA BLUE, WITH BEIGE ACCESORIES. HER CORSAGE WAS OF WHITE CAMELLIAS. MISS MILDRED LETSKY OF TOLEDO OHIO WAS MAID OF HONOR. wALTER kELTON, BROTHER OF THE BRIDEGROOM WAS BEST MAN. ONLY THE MEMBERS OF THE FAMILIES ATTENDED THE CEREMONY AFTER WHICH THEY WERE SERVED A WEDDING BREAKFAST AT THE HOME OF THE BRIDE. A RECEPTION FOLLOWED IN THE AFTERNOON FOR RELATIVES AND CLSOE FRIENDS. MR. AND MRS. KELTON LEFT IN THE EARLY EVENING FOR MELBOURNE FLORIDA, WHERE THEY WILL MAKE THEIR HOME. THE BRIDGE WAS GRADUATED FROM FARMINGDALE H.S. AND STUDIED FOR 3 YEARS AT THE VREELAND SCHOOL OF MUSIC AT BAYOONE NJ. MR. KELTON IS ALSO A GRADUATE OF FARMINDALE HIGH SCHOOL, THE NAVAL TRAINING SCHOOL AT NEWPORT R.I. & THE AVIATION SCHOOL AT JACKSONVILLE FLORIDA. HE ENGLISTED IN 1941, & IS AN AVIATION MACHINIST MATE FIRST CLASS STATIONED IN BANAN RIVER FLORIDA. ANNOUNCE THE WEDDING OF THEIR DAUGHTER MISS CAROLYN MABLE MCDONOUGH TO STAFF SERGEANT JAMES B. MCDONOUGH, SON OF MR. & MRS. ROBERT MCDONOUGH OF MARVEL ALABAMA. THE CEREMONY TOOK PLACE FEB. 24 IN THE CITY HALL OF SAN ANTONIO TEX. MRS. MCDONOUGH IS A GRADUATE OF MEPHAM CENTRAL H.S. CLASS OF 1942 AND WAS ON THE STAFF OF MEADWOBROOK HOSPITAL. SHE MET HER HUSBAND WHEN HE WAS STATIONED IN BROOKLYN. SHE WILL REMAIN IN SAN ANTONIO WHERE SERGEANT MCDONOUGH IS STATIONED. MISS KATHERINE HUFNAGEL, DAUGHTER OF WILLIAM HUFNAGEL OF REEPORT, WAS MARRIED TO CORPORAL DONALD PALK, SON OF MR. AND MRS. RICAHRD PALK OF CYPRESS STREET WANTAGH, SUNDAY AT 6:30PM IN THE FREEPORT METHODIST CHURCH. THE REV. E.A. POLLARD JONES, PASTOR, OFFICIATED. THE BRIDE, GIVEN IN MARRIAGE BY HER FATHER, WORE A GOWN OF WHITE SATIN AND A VIEL HELD IN PLACE AT THE HEAD WITH ORANGE BLOSSOMS. SHE CARRIED WHITE ROSES, MRS. FRANCES REUNIG HER SISTER WAS MATRON OF HONOR & RICHARD PALK JR WAS BEST MAN FOR HIS BROTHER. MARGARET ANNA HUFNAGEL ACTED AS FLOWER GIRL. GEORGE HUFNAGEL AND JOSEPH BREUNIG WERE USHERS. A RECEPTION FOR 30 GUESTS WAS HELD AT THE HOME OF THE GROOMS PARENTS. THE BRIDE WAS A GRADUATEOF AMITYVILLE HIGH SCHOOL AND WAS EMPLOYED IN THE OFFICE OF THE GRUMMAN PLANT OFFICE. WILL LIVE IN FREEPORT? CORPORAL PALK IS A GRADUATE OF FREEPORT H.S. JAMES TINKER JR. TO HAZEL TATEM. MR. & MRS. WILLIAM E. TATEM OF 205 POMANDER ROAD, MINEOLA, HAVE ANNOUNCED THE MARRIAGE OF THEIR DAUGHTER, MISS HAZEL TATEM, TO LT. JAMES TINKER, JR. SON OFMR. AND MRS. JAMES TINKER OF KING STREET, MALVERNE. THE CEREMORY WAS PERFORMED FEB. 10 AT 4:15PM IN THE WOODLAWN METHODIST CHURCH, SAN ANTONIO TEXAS, BY THE REV. EUGENE SLATER PASTOR. THE BRIDE WORE A WHITE BEIGE CREPE FROCK WITH BROWN ACCESSORIES AND A CORSAGE OF ORCHIDS. THE COUPLE WERE ATTENED BY LT. WILLIAM THORNTON AND MRS. THORTON OF WOODLAWN HILL, SAN ANTONIO. MRS. TINKER WAS GRADUATED FROM MINEOLA HIGH SCHOOL. LT. TINKER WAS ATTENDING BROOKLYN POLYTECHNIC INSTITUTE UNITL HIS ENLISTMENT IN THE US SARMY, LAST PARIL. HE WAS GRADUATED FROM MOORE FIELD MISSION TEXAS, WHERE HE REC'D HIS WINGS AND COMMISSION IN DEC. THE COUPLE WILL MAKE THEIR HOME IN SAN ANTONIO. THE ENGAGEMENT OF THEIR DAUGHTER, MISS MIRIAM FISHER, TO FRANK F. VALENTINE, SON OF MR. AND MRS. FRANK VALENTINE OF PARK AVENUE, BALDWIN. MISS FISHER ATTENDED FREEPORT H.S AND IS EMPLOYED BY THE SPERRY GYROSCOPE COMPANY IN GARDEN CITY. MR. VALENTINE, A GRADUATE OF BALDWIN H.S. IS WITH THE GRUMMAN AIRCRAFT ENGINEERING CORPORATION IN BETHPAGE. NO DATE HAS BEEN SET FOR THE WEDDING. CAPT. & MRS. GEORGE UHE OF BINGHAMTON NY AND PENNSYLVANIA AVE FREEPORT, HAVE ANNOUNCED THE ENGAGEMENT OF THEIR DAUGHTER, ENSIGN EDITH CHARLOTTE UHE, U.S.N. R. TO LT. HAROLD CHARLES VAN ARSDALE, U.S. N. , SON OF MR. AND MRS. HOWARD C. VAN ARSDALE OF PLAINFIELD N.J.
ENSIGN UHE IS A GRADUATE OF BALDWIN H.S. & WELLESLEY COLLEGE, CLAS OF 1942, AND IS ON DUTY AT WASHINGON D.C.
LT. VAN ARSDALE ATTENDED PLAINFIELD H.S. & BLAIR ACADEMY AND IS A GRADUATE OF THE GEORGIA INSTITUTE OF TECHNOLOGY, CLASS OF 1941. HE IS A MEMEBER OF THE SIGMA PHI EPSILON. LT. VAN ARSDALE IS ON ACTIVE SEA. DUTY. NO WEDDING DATE HAS BEEN SET. THE FOLLOWING MARRIAGE LICENSES HAVE BEEN ISSUED BY TOWN CLERK FRANKLIN C. GILBERT OF HEMPSTEAD. WARREN RUSSELL PETERS, 36 OF RED STAR WEST VIRGINIA AND MISS DOROTHY BERTHA LEYBOLDT, 20 OF ARGYLE AVENUE, EAST HEMPSTEAD. ALBERT EDWARD BROWER, 21 AND MISS GRACE LILLIAN CREEED, 20 BOTH OF NORTH MAIN STREET, FREEPORT. LOUIS ZAK 38, OF 28-29 44TH ST. QUEENS, AND MISS ESTHER TURNER, 30, OF 1008 CENTRAL AVE. WOODMERE. DONALD ALBERT PALK, 24 OF CYPRESS STREET WANTAGH AND MISS KATERINE HINAGEL 20, OF 74 ROSEDALE AVENUE, FREEPORT. DONALD ROBERT REGAN, 22, OF 229 SOUTH OCEAN AVE, AND MISS WINIFRED HELSUTTER, 24, OF 258 SOUTH BAYVIEW AVENUE, BOTH OF FREEPORT. LEONARD FRED BRESSLISAUER, 24 OF VAN BUREN AVENUE, FLORAL PARK AND MISS HAZEL MATHILDA RAUSCHER, 23 OF 420 MAGUERITE AVENUE, SOUTH FLORAL PARK. DANIEL ANGELO VACCARO 27, OF PORTCHESTER AND MISS MARION CHAMPBELL DEVLIN, 28 OF SPRINGFIELD MASS.